Ok – it has been a while since I created and posted a blog. I probably overdid my first one reporting on my photo workshop to the Grand Tetons. I have several blog posts to catch up on so I hope by the end of the year I will be able to catch up. I will have to continue to fight against the round tuits. My wife, Sara, attends a conference every summer as a board member and I tag along, as it is nice to visit new locations and photograph while Sara attends the conference. This past July we went to Chicago for 6 days and stayed at the Sheraton Grand on the Chicago River. This hotel was ideally central to the locations I wanted to photograph. When I go to a new location, particularly to photograph, I struggle with what local spots to go and photograph other than just the tourist areas especially since time is limited. I do the usual research using Google search and picking up travel books at the library. This just seems to scratch the surface, as the locations that are appealing aren’t easily found and referenced. This is where one I book I bought called “The Photographer’s Guide to Chicago” by Chris Smith helped a lot. Not only did he describe the great locations to shoot in Chicago, he also gave the specific locations with links to Google maps and described when the best time to shoot and with what lenses. This helped enormously as I was able to save the locations on my Google map app on my iPhone and refer to it as I made by daily treks around Chicago. In addition, Out of Chicago, sponsored a Chicago Water Taxi architecture tour during a day I was going to be there. I signed up and spent a day with a group of photographers led by Angie McMonigal taking photographs as we traveled by water taxi to various locations. I have organized my Chicago gallery in the Destinations menu with four sub galleries. The first sub gallery is the Abstract gallery. 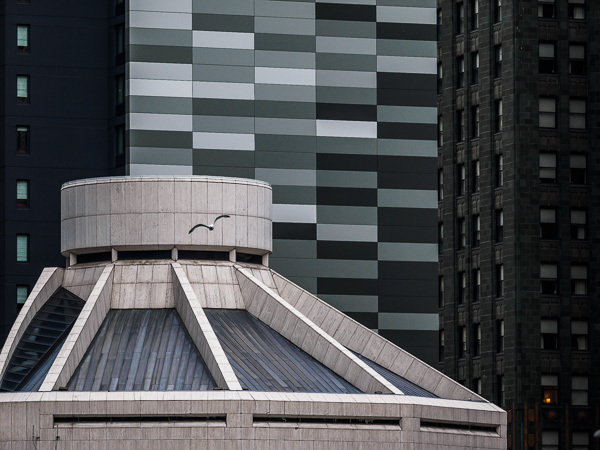 This series focuses on a sense of form, color, pattern and curves than it does on context. The second sub gallery, Architecture, showcases the beauty of the Chicago buildings as I wondered around the streets of Chicago. This is one of my favorites from this series. 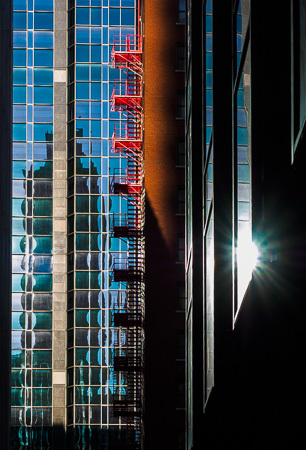 The third gallery, Cityscapes, is a collection showing views from various locations (including our hotel room) around Chicago , such as the 94th floor of 360 Chicago, along the river and long exposure images from along streets and from parking garages. 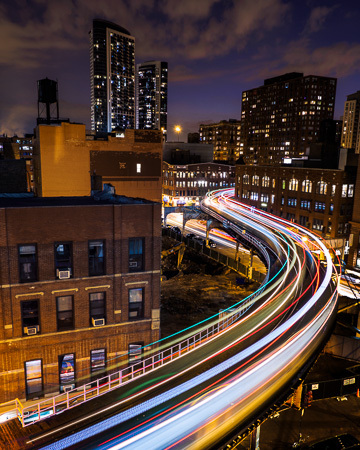 This is my favorite long exposure taken of the “L” taken from a parking garage at the corner of Wells and Kinzie Streets. 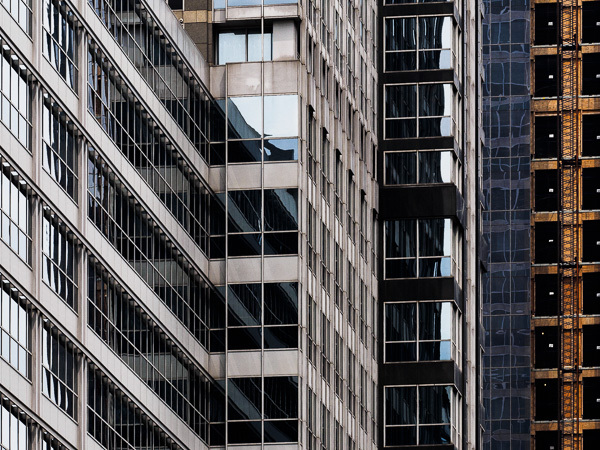 The final Chicago gallery, Urban Quilt, depicts the various geometric patterns, forms, shapes and lines created by the Chicago buildings. This is a term I like and describes the images in this gallery. This term is used by Angie as it looks like a multitude of patchwork patterns used to make quilts. All in all, a productive trip photographically as I continue to learn to see creatively. 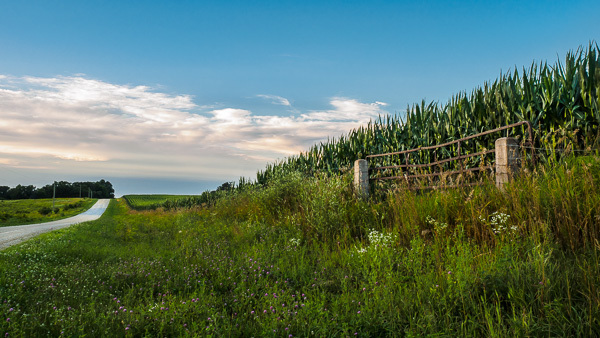 I had a business trip to University of Iowa last week and when I drove from the airport to the hotel I was enamored with the miles and miles of luscious green cornfields. I was determined to take photographs of the cornfields while I was there. Since sunset wasn’t until 8:45p, I took the opportunity to take a drive out in the country after dinner a few nights. I had a vision to photograph the cornfields with the golden sunset light, an old red barn, distinctive rows of corn stalks and puffy clouds. Well, nature didn’t come up with my order, but it did present some alternative opportunities. I would drive out North of Iowa City after dinner scouting out locations. First night was not successful in finding a location worthy of stopping. The second night I came across the Sutliff Historic Bridge. 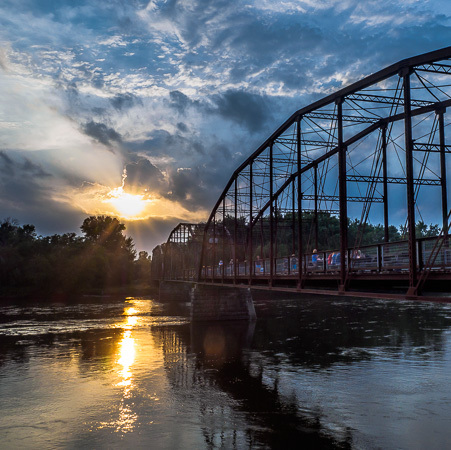 An old bridge that opened in 1898 to allow the farmers to cross the Cedar River to deliver their produce to Iowa City. Originally, there was a ferry that crossed the river at this location and the story is told that a sandbar formed in the river preventing the ferry from crossing the river. As a result this bridge was built. It is now a walking bridge with a tavern on the East side. There are picnic tables on the bridge for drinking and eating. On the second night of driving I was not successful in finding a location that met my criteria for photographing. As a result of being unfamiliar with the Iowa countryside, I almost didn’t go out the third night. I decided to give it a try. I did end up stopping at two locations North of Solon, IA. The second location was my favorite and somewhat challenging. 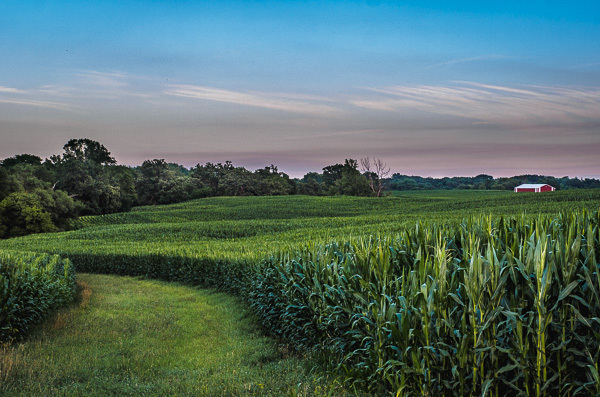 I didn’t find distinctive rows of corn, but I did take photographs of a cornfield that was separated by a waterway. These are planned grassy areas winding across fields to control erosion. Otherwise, on a sloped field, the fields would wash downhill, losing precious soil. I did get a red barn, it wasn’t an old red barn, but a red barn nevertheless. Off to the left of this photograph I attempted to take images showing the farm gate and fence along the edge of the cornfield with the parallel road to lead the eye into the distance. This was my best attempt at it. Finally, the Sunset was starting to get interesting, but the foreground wasn’t all that great. 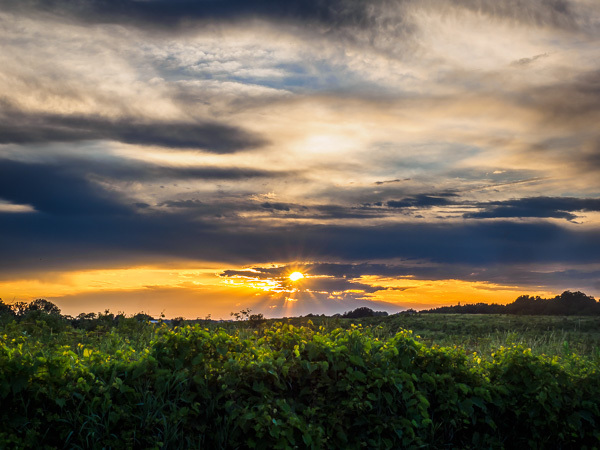 I picked a spot across the road that had vines growing in the barb wire fence and used that for my lower foreground. The Sun came out briefly and I was able to capture this image to wrap it up for the evening. These three images were taken within a span of 20 minutes. Welcome to my blog! I have been working on this website off and on for several months and it is now time to go live. I have been focusing on setting up my galleries and thought it would be appropriate to introduce my most recent gallery of the Grand Tetons. I went on a 5-night photography workshop in the Grand Tetons National Park in Wyoming with Night Photography Workshop led by Mike Berenson and Darren White. 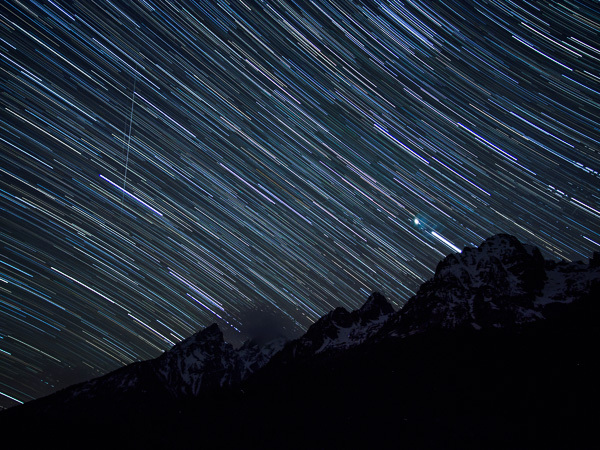 The premise of the workshop is to learn techniques for taking photos of the dark starry skies and after moonrise, to shoot the landscape bathed in moonlight. The workshop was timed to experience the dark skies for several hours before the moon came up. The reason is that the milky way gets pretty much washed out by the moon light. We met at the Ranch Inn every day from 2 to 5pm for classroom instruction and then after dinner, gathered in the hotel parking lot and left at 7:30pm to go to the first location to shoot the sunset and then on to other locations for the dark skies. 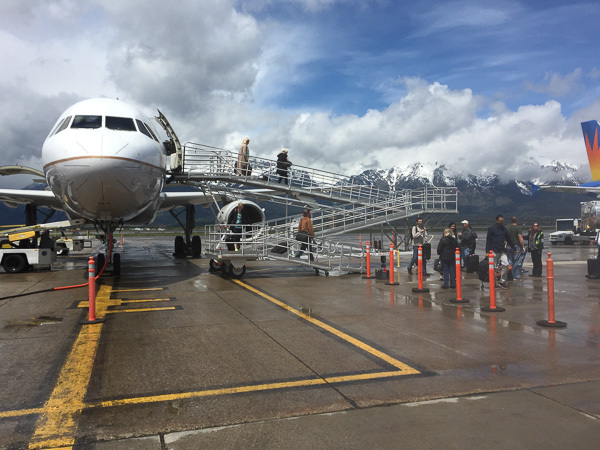 I landed at the Jackson Hole airport in the early afternoon, rented a car, drove to Jackson and checked in at the Ranch Inn. This hotel is conveniently located downtown with restaurants and a small grocery store within close walking distance. After a late lunch, I drove and explored the Grand Tetons NP later in the afternoon for sunset. I drove through the NP and checked out the Jenny Lake Overlook and then went on to Oxbow Bend where the sunlight provided some great backlit trees. I took a number of panoramic photos and this is one of my favorite locations. 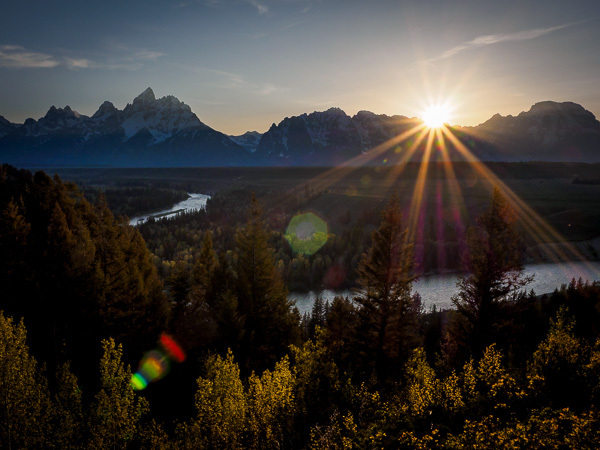 For the final stop at sunset, I went on the Snake River Overlook where Ansel Adams shot the classic Tetons and Snake River image. It was pretty cloudy and sunset colors never did materialized. I was able to take an image and convert it to black and white for a Ansel Adams look alike. It is interesting to see how much the trees have grown up since Adams made that image in 1942. The first set of photos in the gallery reflects the images I made on this driving trip through the Grand Tetons National Park to check out the area. 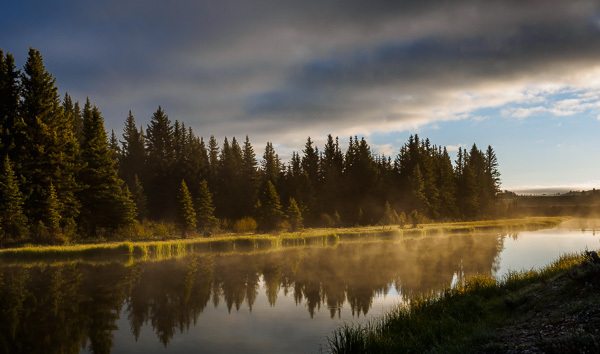 I decided to wake up early the next morning prior to the start of the workshop in the afternoon and head on over to Schwabacher’s Landing, another location along the Snake River that is very popular with photographers. Although it was dark when I got there, I did ask some other photographers there where to go and ended up following them. The clouds enshrouded the mountains pretty much the whole time and the sunrise with the fog bank produced some great light. On the way back to Jackson, I stopped at the Mormon Row Historic District where the Moulton Barns provide an excellent foreground to the Grand Teton range. I took a number of photos there even though the mountains were pretty much encased in clouds. After our first classroom session, for sunset, we went to the Shane homestead. 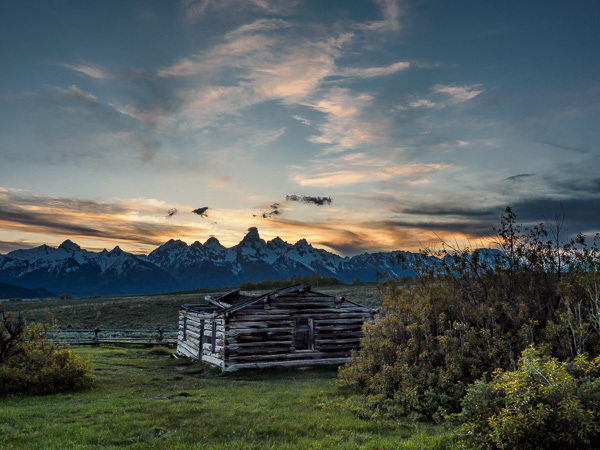 This is a run-down cabin built around 1913, and was featured in the 1953 western “Shane”. It’s a cool spot with a great view of the Tetons out the window looking West. I shot a sunset through the windows trying to frame it with the log beams. After sunset and twilight we set up to shoot the cabin looking east with the Milky Way in the background. The moonrise occurred at 1:30 am and I turned around and started shooting panoramas of the Grand Teton range with the moon light kissing the tops of the clouds. Just after 2 am we drove down to the Moulton Barns to shoot the moon lit landscape. There were some rain showers in the area and one of the photographers yelled out that there was a moonbow, a rainbow created by moon light. We turned our cameras around to the left and captured a number of moonbow images. Keep in mind that we could barely make out the outline of the moon bow with our eyes. For our last stop of the early morning we headed up North just a few miles and checked out Blacktail Ponds Overlook. Some of the photographers walked down the steps toward the river while I stayed on the overlook taking series of images for panoramas. After our second classroom session, we went to the Chapel of the Transfiguration for the sunset shoot. Good color and clouds that evening. After that we went to String Lake Canoe Launch where it was so dark you couldn’t tell you were walking upon the edge of the lake. 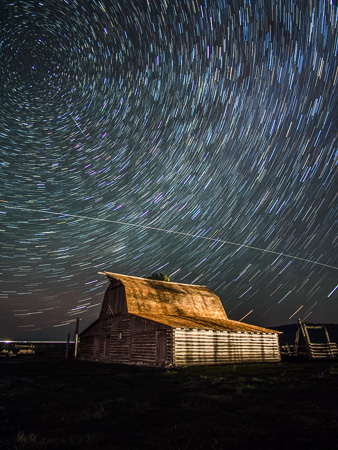 Shot a number of images for panoramas and attempted a star trail shot. I am an Olympus OM-D E-M1 shooter and I knew prior to the workshop that it has shortcomings shooting pin point stars at high ISO. My strategy was to rent a Canon 6D which is known for it’s high ISO low noise capabilities and a Sigma 20mm f/1.4 and Sigma 35 f/1.4 lenses for the short (15 – 25 sec) exposures, high ISO, pin point star images. I used the Olympus on a travel tripod in it’s live composite camera mode to take the star trail shots. Live composite layers each image on top of each other in a lighten blend mode. It’s great as you can see the image building up on the LCD screen. I shot this for around 30 minutes using 60 second exposures at ISO 1600. While this was running I was free to shoot the short exposures with the 6D on my other tripod. This strategy worked great! So I had both cameras mounted on tripods on the lake edge and I was able to capture star trails with the planet Jupiter in parallel with taking short exposure pin point star images on the 6D. Just before 2 am we moved over to the String Lake footbridge where we captured the beautiful Milky Way over the creek. Looking from the left of the image, one can see the glow of the moon before it rose. The far right orange glow are lights from the town of Jackson. This is a great location for shooting dark skies until moonrise. Behind us were mountains that were being lit by the rising moon. Unfortunately, my focus changed when I moved the tripod setup and the images were not sharp. I struggled with sharp photos the rest of the night. This was a lesson learned. Check sharpness magnifying the image on the camera LCD periodically. One of the critical techniques of night photography is that you can’t use auto focus on the stars due to the low light. The focus has to be accomplished by manually focusing on a light source, whether it be a star or distant street light using live view and magnification on the camera LCD, manually focusing until the point source is a small tight circle instead of a blob. Although the image below looks ok at low resolution, the lack of sharpness is very obvious at higher resolution. We ended up back at the Chapel of the Transfiguration just after 4 am for the last stop of the morning and I continued to struggle with sharpness that I did not end up with any usable images from this location. 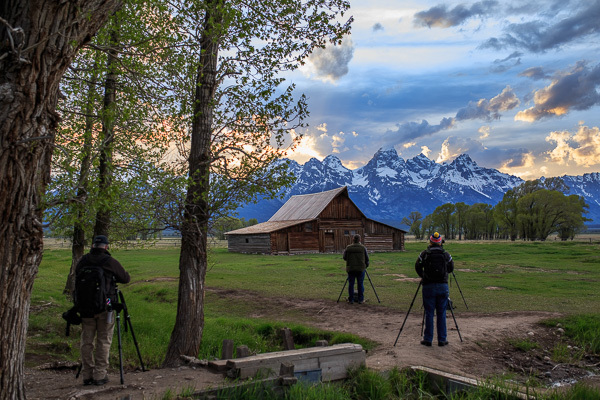 After another excellent classroom session we headed out at 7:30 pm intending to go to Oxbow Bend to capture the sunset. On the way there, Mike and Darren made a call to pull into the Snake River Overlook since they realized that by the time we reached Oxbow Bend, the sun would have dipped below the mountain tops. We went with small apertures to create the sun bursts as the sun crested the mountain tops. This can create lots of flare with some lenses. There was a tremendous amount of contrast between the sky and the foreground. Mike spent some time with us showing us the “magic cloth” technique that he picked up at a previous workshop. The premise is to shoot long exposures (15-20 seconds) and by moving a black cloth in front of the lens to limit light entering in the lens to reduce the exposure for the upper portion or highlighted portions of the frame. This image in the gallery was the result after repeated attempts at refining this technique. Around 9:30 pm we packed up and headed up to the Oxbow Bend Overlook. Since it was still twilight I set up my Olympus in the parking lot for a 30 minute star trail image with the highway in the foreground. During this long exposure the International Space Station flew overhead being lit by the Sun. After twilight I turned my attention to the Snake River bend with a beautiful clear night of stars, the planet Jupiter and with the stars reflecting in the calm waters of the river. It was somewhat difficult getting a clean image because the main road was to the right and headlights of cars were distracting. Before we left around 11:30 p.m. I took a series of images to create a panorama of the milky way. From Oxbow Bend we headed South to photograph the Moulton barns with the rising milky way as the backdrop. We spent several hours at the barns and captured the landscape before and after the moonrise. Before the moonrise I set up my Olympus for another 30 minute star trail exposure and once again the International Space Station graced my image with it’s presence. During the last part of the exposure the barn was blasted with lights from a car that just turned into the street and I thought the image was ruined. I was able to salvage it with processing in Lightroom. Just prior to the moonrise, I then turned toward the Teton range and shot the landscape with the beautiful soft light from the moon. 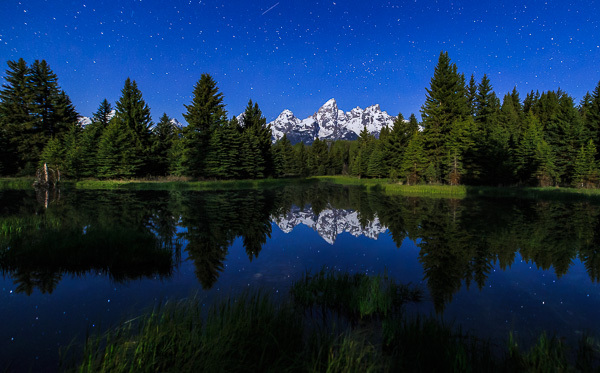 Around 3 am we left the barns for a short drive to Schwabacher’s landing. With the Snake River being so calm we were able to capture a number of beautiful images with water reflecting the stars. I had started another long star trail exposure when the group decided to go back towards the parking lot for a different landscape scene. I left my tripod and camera on the bank taking the long exposure while I went with the group and shot this panoramic scene. Mike and I then hiked back to my tripod/camera and I captured this star trail and it’s cool reflection in the water. On the way back we passed within 6 feet of a beaver feeding in the grass. It was almost 4:30 am when we packed up and headed back to town to go to bed. This was probably the coldest night out. The temperatures dipped in to the 30’s during our photo shoots. By now, I am starting to get into a routine. We once again left the hotel at 7:30 pm and headed back to the barns for the sunset session. It didn’t look too promising at first, but as the sun went down, very nice color within the clouds appeared and this image was my favorite. I took the opportunity to walk around taking photos of my colleagues. After sunset we drove to the Cunningham Cabin, a historic log cabin built in 1885 within the park. We shot the cabin with the mountains in the background. Mike used his little LED panel mounted on a table top tripod placed on the ground about 20 to 30 feet away to provide a very low light glow on the structure we were shooting. One of the other photographers who had been to the cabin before had a vision of taking a photo inside using light painted window to frame the mountains. While they did that, I stayed outside and moved to the other side of the cabin and shot panos of the cabin with the Milky Way as a back drop. From here on out, it got pretty cloudy and we went on to the Jackson Lake Overlook. It was so dark we could barely make out the shoreline and outline of the mountain range and I had to use the camera to “see” what was out there. Amazing what today’s cameras will do. Clouds added an element to this image taken around 1:30 am. 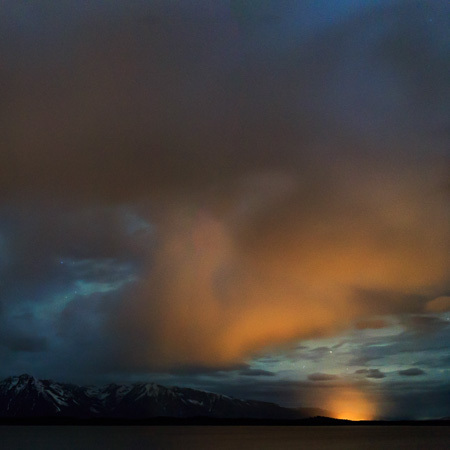 What was surprising was this orange glow Northwest of where we were and were probably lights from Colter Bay Village. I definitely could not see the lights from the Village with my eyes. It seemed to increase in intensity over time. I shot a series of images for panoramics and this image in my gallery shows Mt Moran towards the left. From here we headed over to Signal Mountain, an isolated summit standing 7,720 feet above sea level with a view of Jackson Lake and the mountain range. It was pretty cloudy, but I was able to capture the broad landscape with the rising moon starting to light the clouds. It looks like I also captured an Iridium flare. For our final outing we left at our usual 7:30 pm depature and headed to the Blacktail Ponds Overlook. I walked down to where Darren was photographing and we had the pleasure of witnessing a spectacular sunset. In addition, I shot the below panoramic that looked toward the North. From there we headed to the Jenny Lake Overlook where once again calm waters prevailed providing great reflection of the stars. Although this was taken at 11 pm, some 2 hours plus after sunset, the camera picked up twilight in the West and some color in the clouds. Around midnight we headed back to probably everyone’s favorite location, the String Lake footbridge. I set up my tripod at the other end of the footbridge and was able to take a series of images to create this panoramic of the sweeping Milky Way. I set up my Olympus to take another long star trails image using a dead tree to point at Polaris, the North star and for the third time the International Space Station made an appearance overhead. For our final stop of the workshop, we headed back towards town and went to the Moulton Barns for the moonrise. As usual the Milky Way was spectacular. We used an outhouse as the foreground subject with a little tea light inside to provide a nice glow along with the mountains in the background. Final shot was the barn in the foreground as the rising moon provided a lunar alpen glow on the mountains. After getting some sleep and checking out of the hotel, I walked around town and then headed out to the airport. I had some time before my flight so I drove out to a couple of the spots during the mid afternoon daylight and took a few more photos. I used my infrared converted camera to take this infrared image and the one following was taken in color and I decided I liked the black and white version of the Moulton barn. That concluded a fantastic workshop. Thanks to Mike and Darren for the great instruction and for taking us to fabulous locations to photograph the night sky.